Arsenal made it nine wins in a row in all competitions as they thrashed Fulham 5-1 in the Premier League on Sunday. Maxime Le Marchand’s timely interception denied Lacazette early on, but the France striker broke the deadlock against the run of play 29 minutes in, turning past Tim Ream and drilling home from six yards out, Nacho Monreal with the assist. Fulham’s back three looked exposed with every Arsenal attack and only fine work from Marcus Bettinelli stopped Alex Iwobi tapping home a second, but they snatched an equaliser a minute before half-time, Andre Schurrle clipping a fine first-time finish over Bernd Leno after a good Luciano Vietto pass. Bettinelli made an excellent one-handed save to deny Hector Bellerin just after the break, but he was beaten in the bottom-left corner barely a minute later as Lacazette blasted home his second of the game on the half-volley. Any hope of another Fulham comeback was quelled with 23 minutes left, as Aaron Ramsey, 39 seconds after coming on, flicked a backheel in off the post after a super counter-attack gave Pierre-Emerick Aubameyang room to cross. Aubameyang sealed the victory in style, collecting Bellerin’s cross and firing left-footed beyond Bettinelli on the turn, before striding on to Ramsey’s pass and drilling into the bottom-left corner in injury time. It seemed unlikely after their back-to-back losses to City and Chelsea at the start of the season, but Arsenal are now only a point behind the champions and Liverpool, who meet at Anfield later on Sunday. 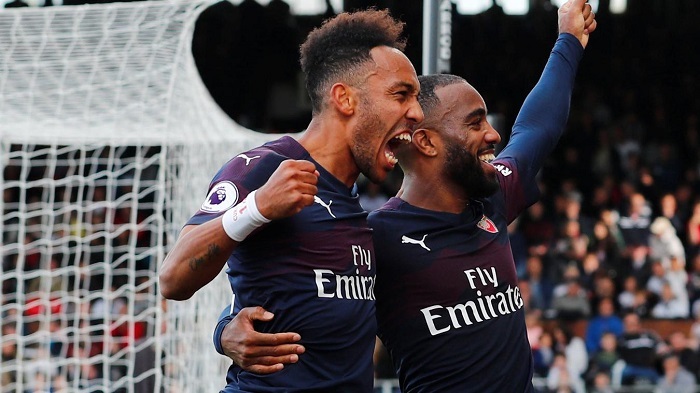 The Gunners are growing in confidence under Unai Emery and are undoubtedly on track for a top-four challenge, while Lacazette’s form comes as a major plus. Fulham, meanwhile, are still without a clean sheet and have conceded more goals than any other side in the top flight. They are just two points above the bottom three, too. Lacazette is flying under Emery this season and scored with his first two shots on target of the match at Craven Cottage. Aside from his goal-scoring, the forward’s all-round play was a real highlight for the Gunners, who are reaping the rewards of the striker’s increasing confidence. Tim Ream’s first outing this season ended in a 3-0 loss to Everton, and this did not go any better for the United States defender. He simply could not live with the pace of Danny Welbeck and Iwobi and allowed Lacazette to turn in the box to score his first goal. He only lasted 54 minutes. Arsenal now have a 15-day rest before they resume league duties at home to Leicester City on 22 October, three days before they head to Sporting CP in the Europa League. Fulham’s next outing is on 20 October, when they travel to struggling Cardiff City in a game that looks even more important after both sides’ losses this weekend.